A job is the best way out of poverty, but only if the wages cover the basic co st of living. Incremental increases to minimum wage have not substantially reduced poverty in Manitoba. The provincial government has made regular increases to the minimum wage, but the pace of these increases is not enough to lift low-income working families out of poverty. The Manitoba minimum wage is $11 per hour. The current minimum wage is not based on any estimate of the cost of living, nor is it indexed for inflation. 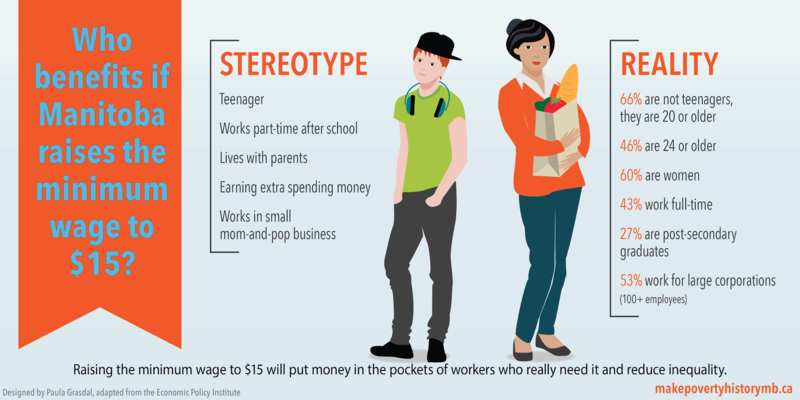 A two-parent family with both parents working full time on minimum wage still leaves them with a household income that falls $1,500 below the poverty line. And for single parents, working full time at minimum wage earns them an income that falls $8,000 below the poverty line. According to Statistics Canada. 38,600 Manitobans work for minimum wage, 55 per cent are over age 20. Another 73,700 Manitobans earn 10 per cent above the minimum wage ($11.77). This means that over 100,000 Manitobans, despite working, are living on or at poverty wages. Increasing the minimum wage to the Low Income Cut Off Before Tax (LICO-BT) measure for a single parent family ($15.53 in 2014), sets the minimum wage based on the actual cost of living. When lower income workers earn more money, they have more spending power and the ability to meet their basic needs. Earning enough to meet basic needs means lower income workers and their families are healthier and don’t have to rely on social services or other forms of assistance. Employers elsewhere have found that employee retention increases, making training investments in staff make economic sense, and lowering hiring costs for business.